If you've got limited time in Japan, which should you visit, Tokyo or Kyoto? Here, I'll give you all the information you need to decide. Tokyo is modern. Kyoto is traditional. Tokyo takes a lot of energy. Kyoto is more relaxing. Tokyo is about 30% more expensive than Kyoto for travelers. If you prefer big cities, modern technology, nightlife and a huge selection of restaurants, Tokyo is for you. If you're after temples, shrines, garden, geisha and hiking, Kyoto is for you. If you've got 4 or more days in Japan, you should see both. It's extremely easy to travel between Tokyo and Kyoto (it takes 2 hours and 15 minutes). Tokyo was almost entirely destroyed during the aerial bombing in WWII, so there are few traditional buildings left. Kyoto was almost entirely spared during WWII, so there are still many traditional buildings left. Tokyo is the political and economic capital of Japan, so it's much more bustling, modern and new. Kyoto, on the other hand, is the storehouse of Japan's traditional culture. So, if you want to see what modern Japan is all about, visit Tokyo. And, if you want to experience traditional Japan, then visit Kyoto. By way of comparison, Tokyo is a bit like Hong Kong or Shanghai, while Kyoto is a bit like Chiang Mai or Luang Prabang. The population of central Tokyo is about 9 million people, while the population of Kyoto is 1.47 million. Tokyo is a huge sprawling city that really feels like several cities connected by a good transport system. Kyoto, on the other hand, feels really compact and you could cycle across the city in about half and hour. Thus, sightseeing in Tokyo can be rather tiring, while sightseeing in Kyoto tends to be relaxing. When you take hotels, food, transport and admission prices together, Tokyo tends to be about 30% more expensive than Kyoto. But, you can definitely find good deals in Tokyo. And, more importantly, both Tokyo and Kyoto cost WAY LESS than comparable cities in other parts of the developed world, especially now that the yen is super weak. So, it doesn't make sense to avoid Tokyo just because it's a little more expensive than Kyoto. What Is Special About Tokyo and Kyoto? Tokyo is the modern Asian urban experience par excellence. It's all about fine dining, great nightlife, brilliant shopping and all the other aspects of urban life that make a big city exciting. The city has one of the world's greatest selection of restaurants, shops and bars, so if this is what you like, you'll LOVE Tokyo. Kyoto, on the other hands, is the Japan of your imagination, the Japan you've seen in all those pictures and movies: sublime Zen gardens, peaceful temples, colorful shrines, classic old neighborhoods and geisha – real geisha – walking down the street. And, just so you know, there are also plenty of great restaurants, shops and bars in Kyoto! Is It Easy To Get From Tokyo To Kyoto? It's absurdly easy to travel between Tokyo and Kyoto. The shinkansen (bullet train) takes 2 hours and 15 minutes and costs Y13,080. For details on traveling between Tokyo and Kyoto, see my Getting From Tokyo to Kyoto page. 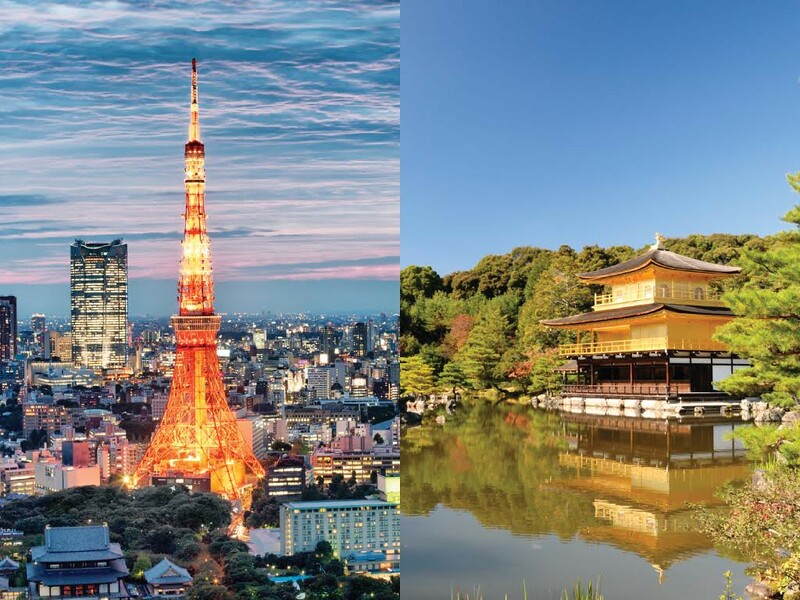 To Sum Up: Which Should You Visit, Tokyo or Kyoto? If you have fewer than 4 days in Japan, you should probably visit only Tokyo or only Kyoto to avoid getting tired. It's better to see one or the other. Use the above information to decide which city is best for you. But, if you've got 4 or more days in Japan, you should see BOTH Tokyo and Kyoto. Indeed, if you're coming all the way to Japan, I strongly advise you to see both cities, since they represent both faces of Japan. Each city is a natural counterpoint to the other and visiting both will provide a full and satisfying experience. For some ideas on how to visit both cities in one trip, see my Tokyo-Kyoto 1-Week Itinerary and my Tokyo-Kyoto 10-Day Itinerary. Visit my other site, InsideKyoto.com, for full details on Kyoto.